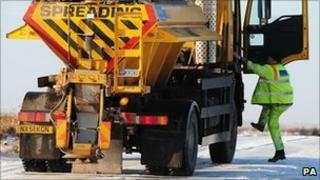 It is hoped that the Bishop of Lincoln's blessing of the county's gritters will take place next week. The Right Reverend Dr John Saxbee has carried out the annual ceremony since 2003 in a bid to cut road crashes. He had been due to bless the vehicles at the Sturton-on-Stowe depot on 7 December, but the event was cancelled so salt runs were not interrupted. The county council said it hoped conditions would be sufficiently improved by Monday. When the Sturton blessing goes ahead, church leaders will simultaneously read prayers at the county's other depots. Bishop Saxbee, who is due to retire in January, said past ceremonies had been followed by a reduction in road deaths, which was "perhaps not a coincidence". David Davies, principal maintenance engineer for Lincolnshire County Council, said: "The gritter blessings play an important role in highlighting the need for motorists to take extreme care and the brave work carried out by our gritting teams. "The revised date is still subject to the weather conditions, as refilling and getting straight back out on the roads is our priority during extreme weather. "However, we hope conditions will have improved sufficiently by the 20th as the blessings can also provide an important morale boost for the drivers who are performing an absolutely terrific job, in very dangerous circumstances, day and night."